Love that ginger. I am growing a couple in containers and just can’t wait to buy more. 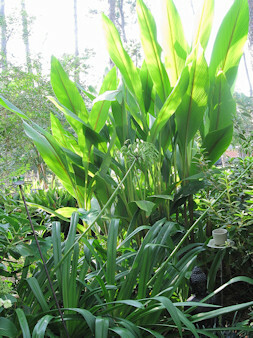 I love the foliage of this Hidden Lily Ginger. It should make a nice screen for you next year. It’s a shame that some of our favorite plants are herbaceous and die back each season. Deb, it really is a great plant. The ones you have growing in containers should spread in a relatively short time, so you can have more without having to buy too many more. Perennialgardenlover, it might be because certain plants are not evergreen that we appreciate them even more. At least it gives us something to look forward to – their coming back in the spring. Wow, that’s a very beautiful plant! I also love your little teacup garden art off to the side there. Very cute! I think it is beautiful, evergreen or not. I wish it were hardy here as I hear it has a nice fragrance? Thanks, Lacey, that little teacup was a gift from a neighbor. It makes a great little watering hole for the birds. Tina, the ginger with a fragrance is butterfly ginger which has white flowers. Hidden lily ginger is a different plant. I have both and they really add to the summer garden. What a great plant, I’ve never seen ginger growing. It looks very exotic. Do you buy it locally, or is it something that has to be ordered from a specialty grower? I’ve become quite fascinated by ginger, thanks to you! Most gingers are available locally, sometimes at smaller nurseries. You can always ask if they will get some for you if they don’t have it in stock. I have seen it offered on line, but I have not had to order any that way. Gingers are interesting plants, and there is such a wide variety to choose from.